STANFORD, California, November 1, 2017 (ENS) – The whole world could be powered by one deep-sea wind farm stretching across the North Atlantic Ocean, finds new research from doctors Anna Possner and Ken Caldeira of the Carnegie Institution for Science at Stanford University, California. Because wind speeds are higher on average over ocean than over land, wind turbines in the open ocean could in theory intercept more than five times as much energy as wind turbines over land. This presents an enticing opportunity for generating renewable energy through wind turbines. But it is still unknown whether the faster ocean winds could actually be converted to increased amounts of electricity. “Are the winds so fast just because there is nothing out there to slow them down? Will sticking giant wind farms out there just slow down the winds so much that it is no better than over land?” Caldeira asked. Other studies have estimated that there is a maximum rate of electricity generation for land-based wind farms, and have concluded that this maximum rate of energy extraction is limited by the rate at which energy is moved down from faster, higher up winds. Possner and Caldeira’s sophisticated modeling tools compared the productivity of large Kansas wind farms to massive, theoretical open-ocean wind farms. 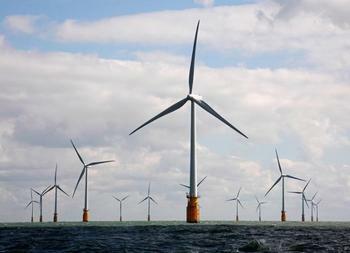 They found that in some areas ocean-based wind farms could generate at least three times more power than those on land. In the North Atlantic the drag introduced by wind turbines would not slow down winds as much as they would on land, Possner and Caldeira found. This is largely due to the fact that large amounts of heat pour out of the North Atlantic Ocean and into the overlying atmosphere, especially during the winter. This contrast in surface warming along the U.S. coast drives the frequent generation of cyclones, or low-pressure systems, that cross the Atlantic and draw the upper atmosphere’s energy down to the height of the turbines. “We found that giant ocean-based wind farms are able to tap into the energy of the winds throughout much of the atmosphere, whereas wind farms onshore remain constrained by the near-surface wind resources,” Possner explained. But this tremendous wind power is seasonal. While in the winter, North Atlantic wind farms could provide sufficient energy to meet all of civilization’s current needs, in the summer such wind farms could only generate enough power to cover just the electricity demand of Europe, or possibly the United States. Wind power production in the deep waters of the open ocean is in its infancy of commercialization. The huge wind power resources identified by the Possner and Caldeira study provide strong incentives to develop lower-cost technologies that can operate in the open-ocean environment and transmit this electricity to land where it is needed. But converting moving air into electricity takes more than placing turbines in the path of the most powerful winds. The combined drag from the turning wind turbine blades puts a limit on the amount of energy from available wind. Previous studies have shown that due to this effect, power generation for big wind farms on land could be limited to about 1.5 watts per square metre. Possner and Caldeira’s new simulations show that in the North Atlantic shows that the limit could be as much as three times higher.